The first time I signed up for Instagram, I remember wondering how come their website didn’t allow me to view any pictures online using either my PC or Mac. The app is great and all, but before hash tags were made available, we really didn’t have a good way to “explore” the community. After having used a few other photo sharing apps before it, I figured it was simply Instagram’s strategy to stay in the mobile photography niche and not go against sites like Flickr who already had a great interface on a normal web browser. If you’re still set on seeing your Instagram photos on a normal web browser, there are websites such as Webstagram and Statigram that act as a web viewer on your laptop or desktop computer. Here’s what I like about both. 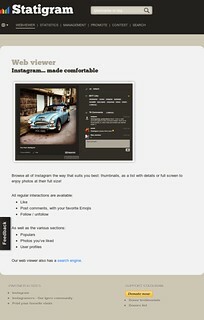 My favourite web interface for Instagram pictures, on PC or Mac. 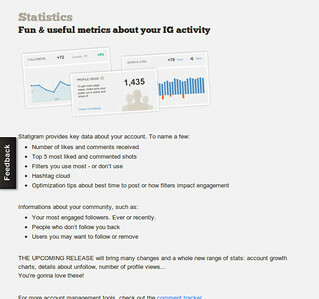 Statigram is first and foremost, a statistics tool for Instagram. Providing you with lots of interesting data for your instagram account. 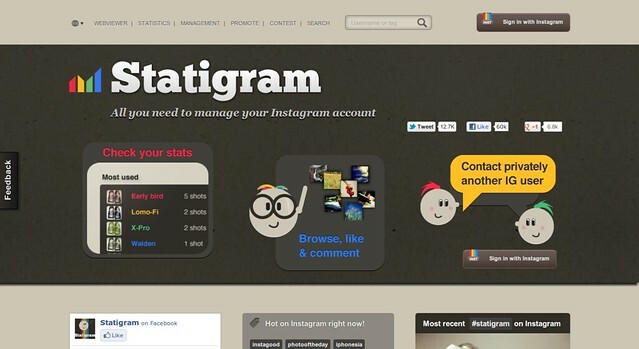 They also provide users with a very convenient web interface to Instagram. Showing you photos in thumbnail or list views. Try out Statigram for yourself. All you need to do is enter your Instagram username & password. Soon you’ll have the convenience of accessing and browsing your photos from your laptop instead of just your iphone or android phone.